Tamara Childs, M.A. (pictured) is both an Intuitive and a Visionary. She writes regularly on inspired living, and teaches on 12academy. Her talent is in illuminating your life path and releasing the self-sabotage that stops you from creating your heart's desire. 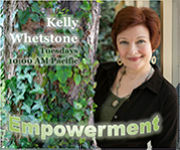 She brings her consciousness toolkit and lifelong study of metaphysics to her weekly show where you can gather insights into creating your inspired life! ELEMENTS of WISDOM This is a show about life and Spirit. Our lives contain the ingredients of the great myths; Love, Loss, Birth, Death, Celebration. Each of us experiences the same themes and we want to share how we live these in our own unique way. The ups and downs, twists and turns of life are part of being human. Elements of Wisdom with your hosts Kathleen & Tamara will bring you stories of Adventure, Courage, Beginnings, Endings, Relationships, Love, Intimacy, Creativity ,Sensuality and Spirituality. Join in the conversation as they explore, discuss,discover, learn and have some fun.